KiDr0Ck0 who bring me on the idea to made it and all help with instructions what bytes needs to change. diablo2oo2 for the Engine, this most powerfull I ever seen, especially the feature with compare edited/changed files with the originals and the port to ollydbg. I want thanks all who make it possible to download old versions like oldapps.com, wish the content will be bigger. 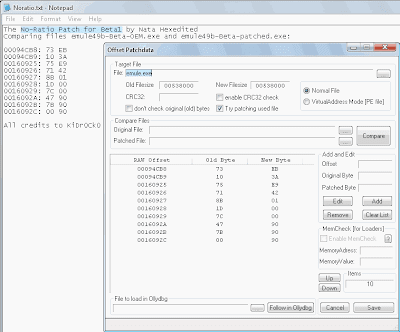 Patcher is good for all eMule 56k Modem user but not limited. 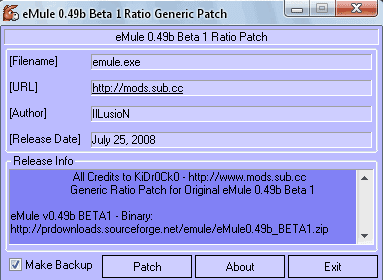 [-] The minimum 30 K upload or download speed limit of the 1:4 ratio by all eMule 0.48a mods using wyx changed bytes + Diablo's search replace patcher engine (min-max settings patt.)?? ?